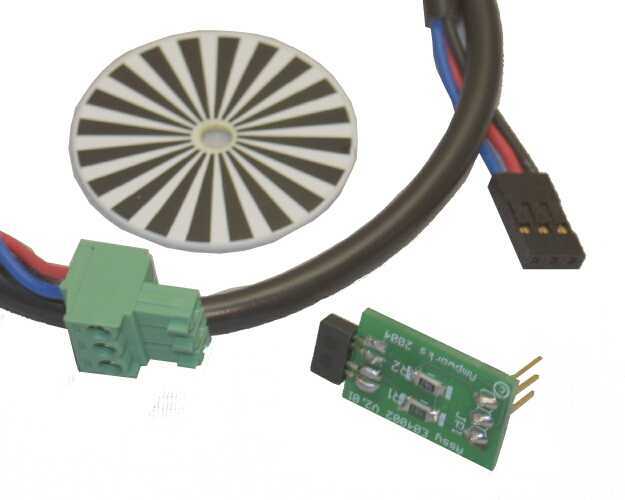 The Meccanisms Rotation Sensor Kit measures rotation by generating pulses as the shaft being measured rotates. 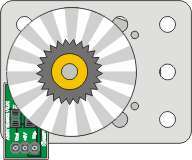 The kit is designed to suit the Meccanisms Geared Motors. In this mode, mount the Sensor PCB onto the Motor Mount Plate using double sided tape (thin stuff, not the foam type). The Encoder Disk is then pressed onto the motor shaft. 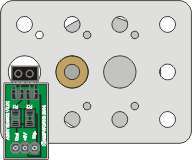 Use one or two washers to space the encoder disk close to, but not touching, the sensor PCB. Of course the black and white sensors need to be facing the Sensor PCB. Connect the cable to one of the Timed Input Ports. Now as the shaft turns, the input port will read either High (1) or Low (0), depending on which colour (black or white) is directly over the sensor. The best way to read these changes is with an Event Handler. Now in our code we simply use the value of Shaft1_Pulse to count the rotationof the shaft. Note that the Rotation Sensor can't tell you in which direction the shaft is turning. In most cases you will know this, because you're controlling the motor!If you really need to know which was a shaft is turning, then you need two sensors on the disk, but set up so that one "lags" the other. See the discussion under "User Input" for how this works using a rotary encoder switch.